Order online or Please call us to order--1-800-274-8602--press 0 Six days a week. Countryside is boasts a beautiful combination of WhiteWash Tones. That is why we call it Pebblestone. Just like the stones that weather into multiple "grey" tones. These gorgeous frames house full sized, deep seated American Made Cushions. 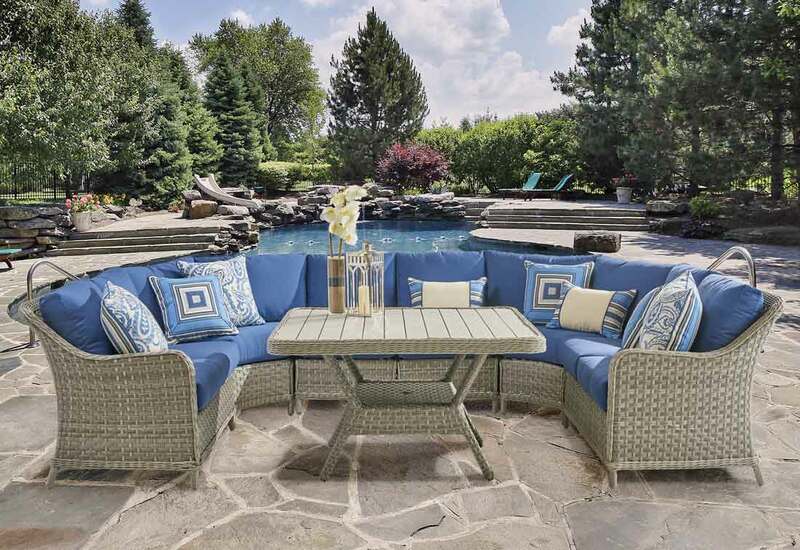 The solid woven synthetic wicker weave is rich & elegant. The frames are aluminum. Please notice the really nice "curved front" corner units. The 16" Throw Pillows can be purchased separately. Fabric Chart--The prices shown on all items are for Grade A Fabric. Our Prices include FREE CURBSIDE Delivery to MOST LOCATIONS in 48 States. Our deliveries are made in 18 wheeler trucks that must be able to drive onto & away from your delivery address.